Apple® AirPrint™ supported. Printer firmware upgrade required (read instructions). Keeping up with your needs—and environmental concerns. 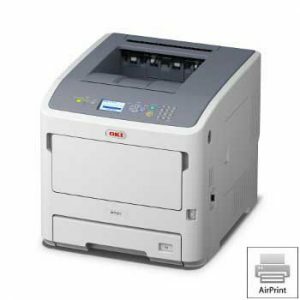 The B721dn and B731dn printers from OKI are designed to enhance productivity in demanding environments. These digital monochrome printers can deliver powerful, cost-effective performance, providing crisp, clear documents with high speed and low levels of user intervention. They’re a powerful, reliable solution for your workgroup printing needs. Feature-rich and up to any task – Perfect for high-volume applications, both printers have high monthly duty cycles. If your business requires lengthy proposals, reports, memos, spreadsheets, schedules, you name it—day after day after day—these are the printers for the job. They’re not just reliable, they’re also fast: the B731dn prints at up to 55 ppm and the B721dn at up to 49 ppm, with the first page appearing in as little as 5 seconds.1 Users will spend less time waiting for their documents—which print at a crisp and clear 1200 x 1200 dpi resolution. With standard duplex printing you can double your efficiency (and save resources) by printing on both sides of the sheet. And with the straight through paper path, you can manually feed sheets of up to 140 lb. (253 gsm) index bristol or up to 80 #10 envelopes from the standard paper tray. LCD display and alphanumeric keypad – These printers are extremely user friendly. A 5-line, blue backlit graphical display and alphanumeric keypad make menu settings and navigation a snap. Messages on the display are easy to read. Administrators can use the printer’s keypad to control user access, and end users can enter PIN numbers to release secure print jobs. Print from a USB Flash drive – Simply insert a USB memory stick into the USB port conveniently located on the side of the printer. Print select file formats without the need for a PC. Just follow the directions on the LCD display, and you’re on your way in seconds. At home in your environment – B721dn and B731dn printers are compatible with current Windows® and Mac® operating systems, and all are equipped with high-speed USB and 1 Gigabit Ethernet connectivity, so that everyone can take advantage of the productivity and cost savings. 1 Published performance results based on laboratory testing of print speed on letter-size sheets. Individual results may vary. 2 Memory DIMM sold separately. 3 B731dn only. 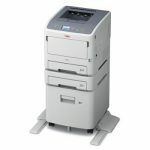 Both models available with 18,000-page and 25,000-page toner cartridges. Declared yield in accordance with ISO/IEC 19752. The B721dn and B731dn fit the way you work– today and, through an array of performance enhancing options and upgrades, they can adapt to match your future printing needs. Both models come with 256 MB of memory and 630-sheet paper capacity. You can increase memory to 768 MB1 for processing large files and add a 160 GB hard disk drive for file storage. You can boost the paper capacity to a maximum of 3,160 sheets. Options include up to three additional 530-sheet paper trays or a 2,000- sheet Large Capacity Feeder. ENERGY STAR® compliance – With their lower power consumption, these printers meet the government’s standards for energy efficiency. 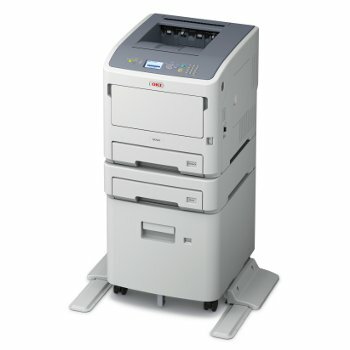 Duplex (2-sided) printing – This technology allows for savings in energy and resources, in addition to using less media. One-piece consumables – Long-lasting, user-replaceable printer cartridges remain friendly to your budget while lowering the number of items to dispose of or store. Low power consumption – These finely engineered printers perform with low power requirements during regular operation, especially in Deep sleep mode. 1 Memory DIMM sold separately. 2 Declared yield in accordance with ISO/IEC 19752. 3 Available in the U.S. and Canada only. 4 Published performance results based on laboratory testing of simplex (1-sided) print speed. Individual results may vary. Monthly Duty Cycle: B721dn – up to 250,000 pg. ; B731dn – up to 280,000 pg. Recommended Monthly Print Volume: B721dn – 3,000 – 20,000 pg. ; B731dn – 5,000 – 30,000 pg. Scalable Fonts: 90 PCL fonts; 136 PostScript fonts.